Below is a description of the bond strength of Ultraguard Super Epoxy. Only UltraGuard uses a proprietary mix of polymers that actually bonds permanently to the pool substrate. Imagine a coating that has a structural compressive strength of 14,000 PSI, which is virtually indestructible and has an adhesion bond of 2000 PSI. These properties make it virtually impossible for UltraGuard to pop-off, delaminate or have product disintegration allowing it to last longer than the warranties offer. UltraGuard’s penetrating bond coat stops hydrostatic pressure which causes pop-offs and delamination. This allows for the three following top coats to permanently bond with the swimming pool substrate both physically and chemically. 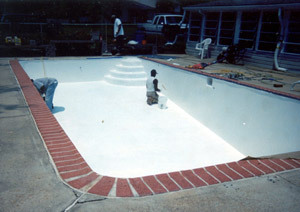 Now all the coatings become part of the swimming pool structure. No other pool company or product can make the above statements. This is the highest of high-tech swimming pool resurfacing technology. Our family of products are used on warehouse floors and loading docks where they easily withstand extremely harsh exposure to 5-ton fork lifts, acid concentrates and other industrial conditions. These environments have proven that UltraGuard is indeed the toughest STRONGEST BOND coating in any industry today. NO OTHER COATING OR POOL COMPANY CAN MAKE THIS STATEMENT. 2,000 PSI BOND!